Welcome Novice, Maria Huber! God bless you! Today, August 2, 2016, is a blessed and special day for Maria Huber and our monastic community! Maria officially started the year-long novitiate during a special ceremony at Annunciation Monastery which was held prior to evening prayer. 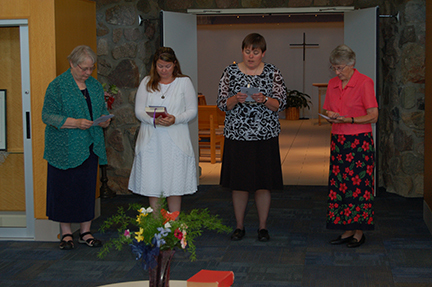 Surrounded by the community of sisters and her family, Maria expressed her desire to seek God with the Benedictine Sisters of Annunciation Monastery. With the guidance of Sister Nicole Kunze, prioress, and Sister Agatha Muggli, novice director, and all of the sisters, Maria will become more deeply immersed in the Benedictine way of life. As a novice, Maria will study the Rule of St. Benedict, the rich Benedictine history and values, chant, and will devote focused time to prayer, contemplation and living the monastic life. Only on special occasions will she leave the monastery enclosure. Please keep Maria, and all of our women in formation, in your prayers. Thank you, God, for the gift of Maria. Please bless her as she enters this new step of her journey as a novice of Annunciation Monastery.